The Fast Chef Elite+ range of counter top, ventless* fryers can cook and re-generate all of your usual snack, tapas and appetiser favourites quickly and simply making the FCE+ the ideal addition to any business who has been looking to offer amazing fried foods but don’t have the space or the extraction system to do so with a conventional open fryer. The Fast Chef Elite+ range of counter top ventless fryers is one of the winners in the ‘Innovation’ Category of the Food Equipment Journal’s ‘Foodservice Equipment of the Year Awards 2018’. The Fast Chef Elite+ range of ventless* counter top fryers utilise a unique EcoFry condensation filtration system which allows them to installed almost anywhere without the necessity of installing expensive extraction hoods. Frying – it protects the cooking oil from UV light, water and oxygen extending its useful lifespan. 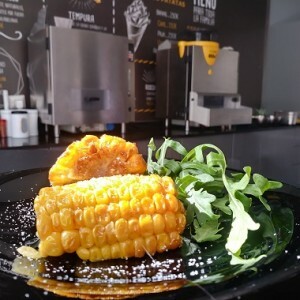 Drained, Golden & Crispy – the water and solid particles produced during the frying process are extracted away from the cooking chamber prevent ing it from contaminating the cooking oil, preventing unnecessary transfer of flavour between products. Extraction – the steam drawn off during the frying cycle is condensed in a specially designed coil to remove large particulates and moisture. The dry air is then filtered through an activated carbon filter before being exhausted back into the working environment. The EcoFry technology developed by Quality Fry in its equipment for the hotel and restaurant sector has received recognition from the European Commission, and funding from the SME Instrument project Phase 2 within the Horizon 2020 Research and Innovation Framework Programme. SME Instrument is a highly competitive project, the objective of which is to promote, advise and fund small and medium European enterprises developing technologies and products with the potential to transform the market, aimed at improving productivity, energy efficiency and sustainability. 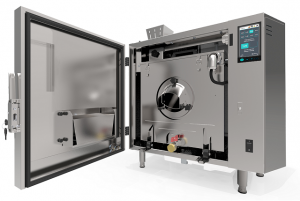 To ensure the ventless operation of the Fast Chef Elite+ is maintained, the daily, weekly, monthly and annual cleaning procedures MUST be followed and the internal panel grease filter and cylindrical activated carbon filter need to be replaced at the recommended 8,000 cook cycle interval. Failure to do so may invalidate any warranty. Quality Fry ventless fryers greatly reduce the need for dedicated extraction systems and smoke hoods but this does not guarantee that a Fast Chef Elite fryer can be installed into every business. Taylor UK advises customers that it is their own responsibility to check with their landlords and local authorities to ensure that their operation complies with the necessary local business codes should they choose to install a Fast Chef Elite in their business. ‘Ventless’ Technology* – the condensation filtration system removes, grease, moisture and particulates from the cooking chamber, reducing the need for expensive extraction hoods. Energy Efficient – the FCE+ uses up to 24% less energy* compared to a regular open fryer. Reduce Oil Consumption – the FCE+ uses up to 37% less oil* compared to conventional fryers . Faster Frying Times – the enclosed frying chamber prevents unnecessary heat loss, reducing frying times by up to 27%*. Minimal Flavour Transfer – the FCE+ filtration system actively removes steam from the frying chamber preventing flavours contaminating the cooking oil. Two Cooking Modes – two individual portions can be cooked at the same time, alternatively one larger portion can be cooked as required. Multi-Portion Cooking – the Carousel model can cook two portions at the same time, while four additional portions wait in the automatic hopper.